M. Wolf discovered asteroid #499 Venusia. J. H. Metcalf discovered asteroid #581 Tauntonia. Reginald A. Fessenden of Massachusetts claims to have been the first to broadcast music over radio in a radio program consisting of a poetry reading, a violin solo and a speech. C. W. Tombaugh discovered asteroid #2941 Alden. A. Patry discovered asteroid #1756 Giacobini. USSR Luna 13 soft landed on the Moon and returned its initial Lunar surface images. The Luna 13 spacecraft was launched 21 December 1966 toward the Moon and accomplished a soft landing on 24 December 1966, in the region of Oceanus Procellarum. The petal encasement of the spacecraft opened, antennas were erected, and radio transmissions to Earth began four minutes after landing. On 25 December and 26 December 1966, the spacecraft television system transmitted panoramas of the nearby Lunar landscape at different Sun angles. Each panorama required approximately 100 minutes to transmit. The spacecraft was equipped with a mechanical soil-measuring penetrometer, a dynamograph, and a radiation densitometer for obtaining data on the mechanical and physical properties and the cosmic-ray reflectivity of the Lunar surface. Transmissions from the spacecraft apparently ceased before the end of December 1966. 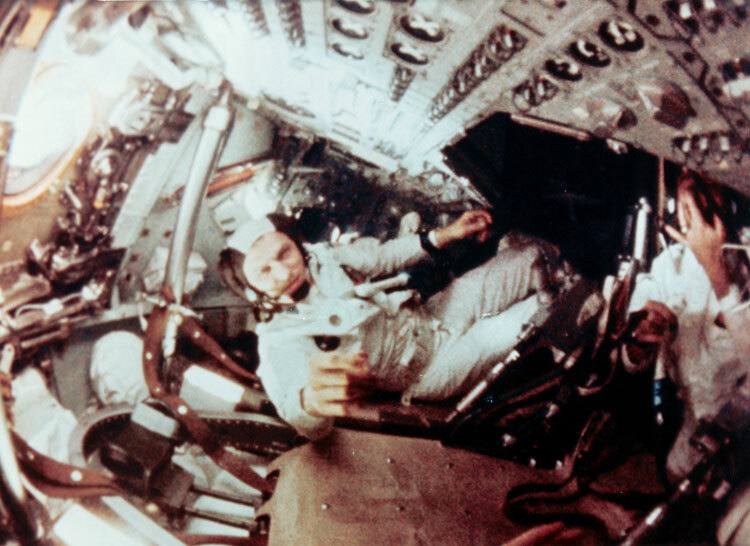 NASA's Apollo 8 astronauts Borman, Lovell and Anders became the first men to reach and orbit the Moon. Apollo 8 astronauts took the "Apollo 8 Earthrise View" photograph of the Earth rising over the Lunar horizon. C. Kowal discovered asteroid #2134 Dennispalm. L. Zhuravleva discovered asteroids #3074 and #3566. Technological Capsule (CAT) 1 was launched on Ariane 1, the first European Space Agency launch, and the first Ariane rocket launch.